The Saint Charles Rehabilitation Center began in March of 2010 as a response to the needs for therapy of patients who had suffered severe trauma after the earthquake. Through swift local and non-governmental organizational (NGO) action, many people who suffered severe spinal cord injuries and amputations had fortunately survived. This however created a substantial population of people now living with disabilities. Additionally many of the established organizations addressing rehab and the needs of people with disabilities had similarly suffered tremendous damage of their facilities because of the earthquake. Thanks in no small part our fast acting supporters, HMMoM was able to collect the necessary medicines, equipment and other materials to launch an inpatient rehab center. When the five sea containers finally arrived at the port in March, our supporters had donated over $200,000 in rehab equipment to help launch the center. 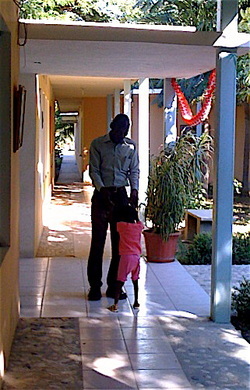 The center is currently staffed by two American long-term volunteer therapists, two Chilean volunteers from America Solidaria, two Haitian therapy technicians and part-time orthopedist and X-Ray technician. In January of 2011, HMMoM was please to secure both Jeanie Zelinski, an occupational therapist and Memphis native, and Erin Cottos, physical therapist, based in Corpus Christi, TX to commit one-year to staff the center and act as mentors for our Haitian therapy staff. In March of the year, America Solidaria was also able to provide two therapists from Chile, Camila Castror and Daniela Paz Feuntes Seda. HMMoM is always looking for volunteers therapists to come to our clinic. Visit our Get Involved page for more information on opportunities.